More and more companies are looking for ways into the Chinese market. Establishing a successful business in China today involves the immensely popular mobile app WeChat. However, a simple company profile on the app does not suffice. Successful WeChat marketing requires professional H5 pages. WeChat dominates the Chinese online market. In the third quarter of 2017, the number of active users amounted to more than 980 million, and this number is expected to grow further (Source). WeChat was made for mobile and is not available for desktop computers. 76.5 percent of Chinese smartphone owners use WeChat. By 2021, this share will rise to just under 83 percent (Source). The WeChat universe covers different areas and brings them together in a single app. In "Moments", users can share experiences, photos, etc. with their followers, who in turn can like and share these posts. In the community section, every user can create groups and invite individual users to join. Companies can also launch online shops in WeChat. Moreover, the app has its own banking application. This is so well-established that users can pay for almost anything using their WeChat profile in China - from parking to dinner. An own job module as well as a search function similar to Google are further WeChat features. Traffic for the company profile can be generated by means of a paid ad or banner campaign and organically by providing engaging, shareable content. Traffic can also come from offline: QR codes are often used to link from product packaging or billboards to WeChat. Due to the app's numerous features from company profiles to communities to online shops, businesses can achieve a very large reach with WeChat and communicate to potential customers, employees and partners on many different levels. A classic WeChat Moments profile has a simplified, pre-defined structure. In order to stand out from the crowd and communicate in accordance with corporate design guidelines as well as to publish brand and product messages professionally, so-called H5 pages are key. Seamlessly integrated into the profile, the small html5-based websites ensure a professional and individual online presence on WeChat. Marketers can of course use marketing tools such as banners, ads and sponsored posts. State-of-the-art digital marketing with marketing automation can be used as well to unlock unique lead generation and qualification processes, which is particularly valuable in B2B marketing. While people in Germany and Switzerland differentiate between professional networks such as LinkedIn and social networks like Facebook or Instagram, WeChat profiles usually combine the private with the professional. In addition to information on hobbies, people also share information about their careers. This rich profile data is a treasure trove that can be accessed through an API and used for marketing purposes. However, profiling requires interaction with a business's own database. Tools such as the H5 Page are a tremendous help with regard to tracking user activity on company-owned systems. H5 pages can be connected to the WeChat CMS. Tracking codes of an external analysis software can be implemented in the H5 page. The software will then receive all the information about user behavior that has taken place within WeChat and create a profile with the ID of the respective user as well as demographic data such as age, gender, etc. W4 has developed a special WeChat module based on the requirements of state-of-the-art marketing automation software to realize such trackable H5 pages. In addition, the analysis software enables the fully automatic identification, addressing and qualification of a (potential) lead. We-Tomation works with user IDs and sends automated push notifications to the WeChat app. W4 has realized a WeChat project forSchleuniger. 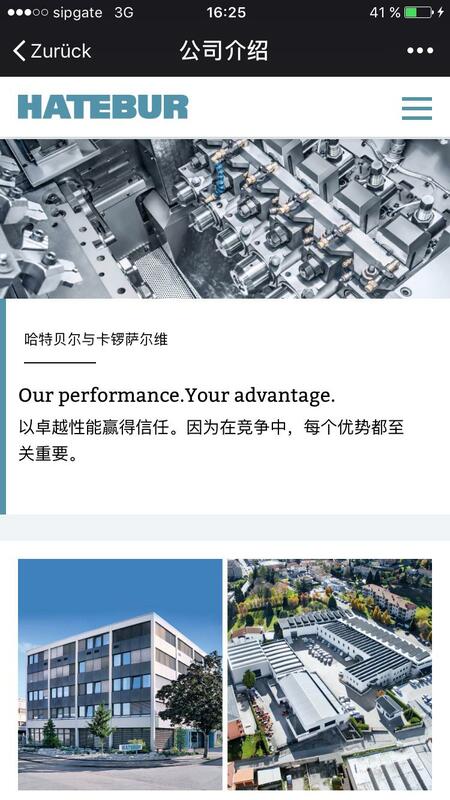 The Schleuniger Group in Thun is a globally active technology company and a leading supplier in the Wire Processing industry.S chleuniger relied on WeChat when it entered the Chinese market. W4 assisted the company during the process as a local partner. As part of the first phase, the WeChat corporate identity including H5 page was developed. In the next step, we realized trade fair promotions with Schleuniger to generate traffic. In phase 2, additional traffic was acquired through interactive content, on-pack promotions and mini applications in WeChat. 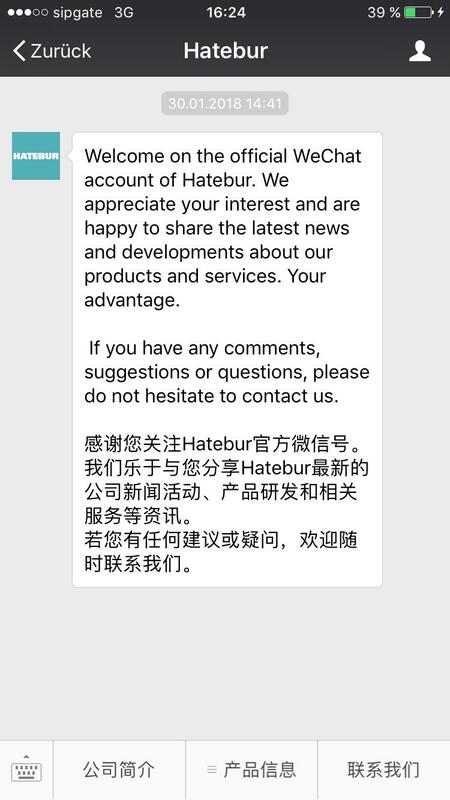 W4 has also implemented a WeChat H5 page for the Swiss company Hatebur, a manufacturer of high-quality forming machines. The company uses WeChat for competence marketing at all levels of lead qualifications. A technology ebook is made available to interested students and professionals in order to reach potential customers who consider using alternative forming technologies in their company. Read more about Digital Marketing in China.